I promised this week would not be a Mexican-inspired meal and I held true to my word and I am sharing one of my newest healthy recipes! 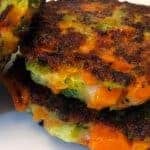 These crispy broccoli and carrot vegetable patties are a very kid-friendly recipe as long as you merely blanch the veggies instead of cooking them. Once the broccoli smell permeated the house, my three year old declared he wasn’t eating the smelly broccoli. And, he didn’t. I tried to convince them of how good they were with cheese and carrots and onions but nothing worked. Three year olds are very stubborn when they make up their minds! 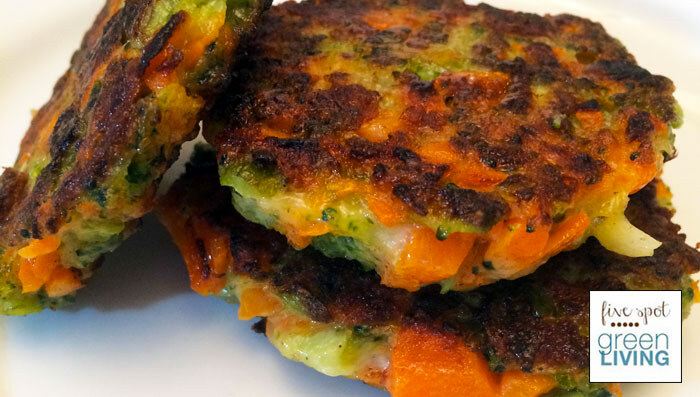 These crispy broccoli and carrot fritters are great to pair with other healthy healthy recipes! My older child absolutely loved this dish and I loved feeding them to her! We all know broccoli is healthy and good for us and we should all be eating more of it, but do you know why? Did you know that a cup of cooked broccoli offers as much vitamin C as an orange? Broccoli contains vitamins B1, B2, B3, B6, iron, magnesium, potassium, and zinc too. It also provides fiber and is low in calories according to the Dairy Council of California. Start by cutting the florets off the steamed broccoli and cutting them into small pieces. Cut the stalks into small, thin slices. Peel and chop the carrots roughly. In a food processor combine the flour, eggs, dijon mustard and garlic. Mix until well combined. Heat the olive oil in a frying pan on medium heat. Once hot, use a ladle to spoon the batter into the pan to form small patties. Allow the fritters to cook for 3 minutes until lightly golden and then flip and cook for 2-3 more minutes on the other side. Once cooked transfer to a paper towel and keep warm in the oven while you cook the remainder of the fritters. Heat the olive oil in a frying pan on medium heat. Once hot, use a ladle to spoon the batter into the pan to form small patties.. Allow the fritters to cook for 3 minutes until lightly golden and then flip and cook for 2-3 more minutes on the other side. Once cooked transfer to a paper towel and keep warm in the oven while you cook the remainder of the fritters. 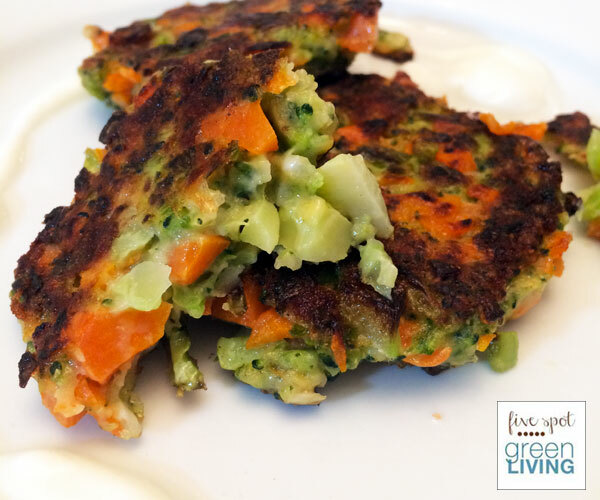 Try these amazingly easy and healthy vegetable patties for your family with these other meals this week! This makes the best thin-crust pizza with semolina and bread flour. Make sure you follow her tips on handling the dough, too! My son also thought of ketchup as a food group of its own. I think it’s the dunking part. Ha! It must be the dunking! 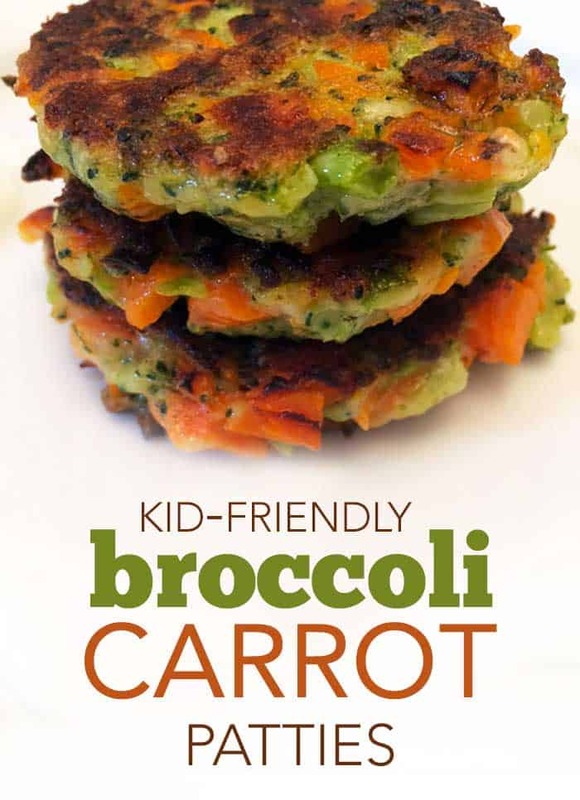 I’ve never thought of putting Broccoli and Carrots together as Fritters. But, now that I see the results, I want to make the recipe ASAP. The Fritters look delicious and the best part is – is that its good for you – AND tastes great. Yes Tammy – they are delicious! You definitely have to use the scallion, though. They are so easy Silvie! Enjoy! Wow, these just look delicious! These are going to be made this week. Thanks so much for the recipe! Great Melissa! They are yummy.I hope you enjoy them! What a great way to get more veggies into my diet. I have to make these for bible study tonight. I have to make these STAT!!! Those look so good. I love fritters and even better if they are healthier. I wish I had been there! I would have eaten any he didn’t. I adore broccoli but have never seen it prepared in this fashion. I cannot wait to try it! I love healthy veggie recipes, and broccoli and carrots are some of my favorites! These sound so good! Thank you for sharing!!!! These look soooo good! Thank you for sharing the recipe. 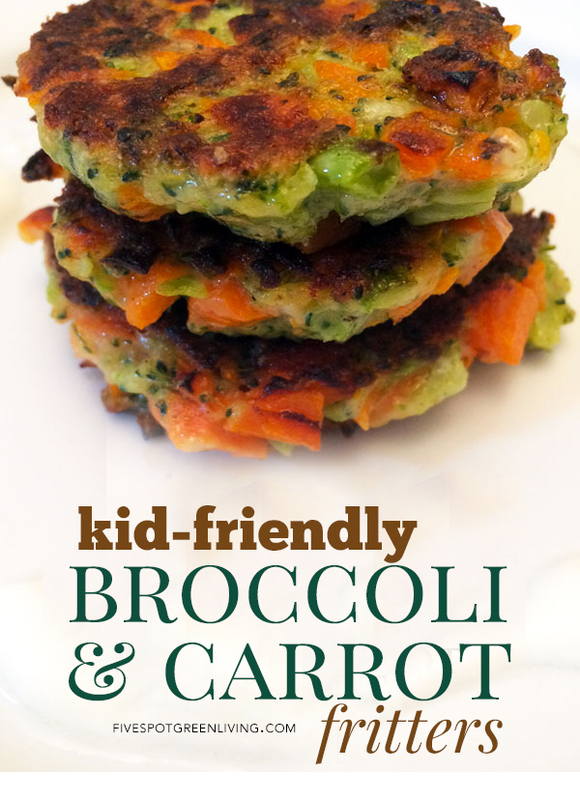 I love the idea of sneaking some veggies into my daughters diet in these fritters. We will definitely be giving this one a try. 🙂 Thanks! Sounds like a great way to get some broccoli into my fussiest eater… my husband! Being born and raised in New Orleans, I had to modify these. The basics are good, but I used twice as much broccoli and green onions, as well as seasoning with Mrs. Dash Original (salt-free). I added black pepper and iodized sea salt. I floured for consistency. No measuring. I found it hard to get them unstuck from spooning into a 1/4 cup measurement, so I used the top to a Smucker’s peanut butter jar, sprayed with olive oil on the inside, and pressed patties into that. Turned it over into my palm. Slap, slap! And they came right out in perfect size. Pan fried in an iron skillet 2 minutes on each side, and voila! Bon appetite!! (I posted photos at Sandra Maureen on FB) Thanks for the recipe, y’all!! See the picture, but there’s no recipe listed. ?? Can you send please? Hi Robin – Not sure I understand. The recipe is below the photos and before Tuesday’s meal idea. Let me know if you still can’t find it and I will forward. Thanks! These look fantastic! Broccoli and carrots are two of my favorites. I think the addition of the Parmesan cheese is a unique touch l, very savory. Those look so good!! Pinned! thanks for sharing on the What’s for Dinner link up! Looks and sounds delicious. Can’t wait to try. I love that you use the stalks as well as the florets in your fritters! I might use chickpea flour for added protein, great recipe. Thanks! A fabulous way to get kids to eat healthy! Thanks for sharing your recipe with us at #OvertheMoon Link Party. I’ve pinned and shared. This look so yummy and I have to try. Thank you for sharing at Dishing it and Digging it link party. My family loves these! They’re a great way to get more veggies in! After making these fabulous tasty fritters, I just wanted to let you know how much I loved it! Although there are no kiddos in this household, this was an adult-pleasing recipe. My husband reached across the table for a second serving. Finally! A recipe with broccoli that is actually delicious. My family thanks you. These weren’t just Kid Friendly – the whole family loved them. So easy to do and tasted great cold for a packed lunch the next day as well. I have one kid that will tear these up and one kid who’s a maybe. He’s frustratingly picky but I’m going to give this a try. I know I will love them! I cannot wait to try these!! My son is so picky! Thanks for sharing at the What’s for Dinner party – enjoy the rest of your week! These look yummy and fun! Kids will love this new way to eat vegetables. Thanks for sharing at Fiesta Friday! These look just my thing and I love how you’ve given nutritional info for broccoli. 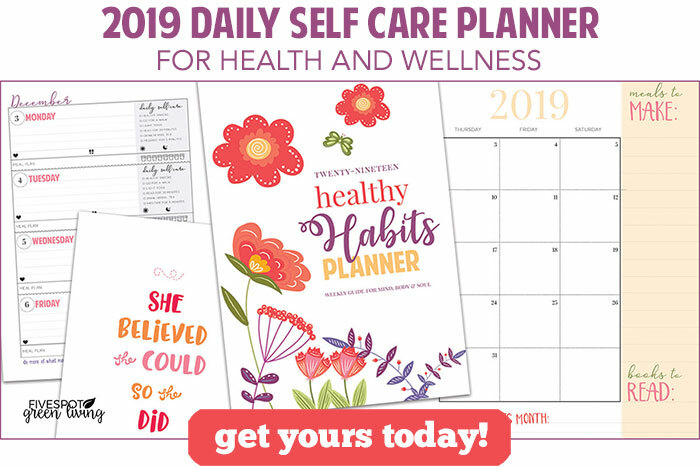 Thanks for linking up with Fiesta Friday – don’t forget to add your party links for a chance to be featured the following week. Looking forward to trying this recipe this week when a friend comes around for dinner. Will serve it with roast chicken. This recipe reminds me of English ‘bubble and squeak’ which is mixed with mashed potatoes, brussel sprouts and veggie leftovers from Christmas dinner. Gently fried in butter and served with cold turkey, chicken or whatever the favoured roast was from Christmas day and just so yummy! Think next day ‘leftovers’ are simply the best!